Saving money is at the forefront of everyone's minds these days, as the economy is still in the process of straightening itself out. As a result, many people have had to make cutbacks, whether it's scaling back on all those cable channels, reducing the number of minutes available on their cell phone plans or opting for a wedding gown made out of toilet paper. Wait, what? Believe it or not, women all over the country have been using the paper bathroom accessories to make dresses that really could look perfect on a bride walking down the aisle. The 8th Annual Cheap Chic Weddings Toilet Paper Wedding Dress Contest, sponsored by Cheap-Chic-Weddings.com and Charmin, held their final judging event at Ripley's Believe It or Not! Times Square Odditorium in New York recently, reports The Huffington Post. The winner of the event, who took home a prize of $2,012, was Susan Brennan of Lake Orchard, Michigan, who actually won the event last year as well. The 26-year-old designer used a total of 10 rolls of toilet paper to make the dress, which also relied on glue and thread. She was apparently able to put it all together in just a week. "I wanted something really original, something young brides would want to wear," she said. "Like the high-low hem, so your shoes can show, a really fun back, with the cut-outs, very modern... It's my little bohemian cupcake." The contest had a total of 700 entries this year, which makes Brennan's feat all the more impressive. It also means that a heck of a lot of toilet paper had to be used, but luckily the entrants got a little help with that. 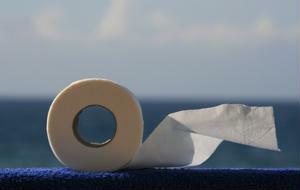 Charmin reportedly provided coupons to help them cover the costs of buying all that paper. Cheap-Chic-Weddings.com is a website dedicated to helping brides-to-be save money on their ceremonies, so it's only fitting that they would sponsor such a thrifty event. They came up with the idea based on a popular bridal shower game and over the eight years that the event has been running, the popularity and skills of the entrants has increased. "The quality of talent that presents itself each year always amazes us," Susan Bain, one of the founders of Cheap Chic Weddings, said. "This year's entries included several dresses that had intricate details like faux embroidery, ruffles, pleats and even lace effects." Perhaps making a wedding gown out of toilet paper isn't such a bad idea for saving money on a wedding after all, considering they're so gorgeous!